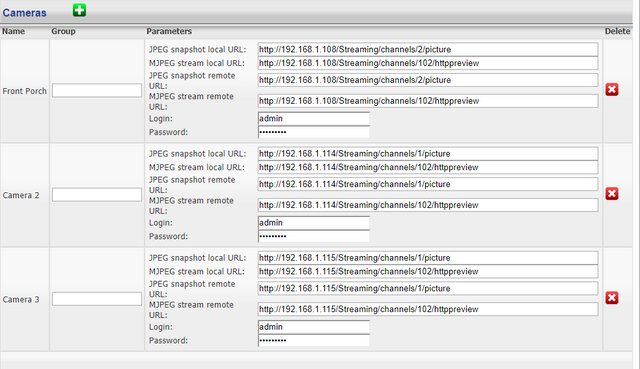 How is your camera setup in the config page of the plugin? Please post a screenshot. Pretty much the same as before, only local URL's copied to remote. Here is an updated screenshot of it. Local works for me if i'm at home on my wifi (i.e. if i'm local). The problem is when i turn wifi off (phone is then connecting through cellular network). Then it all stops working regardless of IOS app settings (auto / local / remote). If I have IOS app set to auto or remote, I get either a "the request timed out" on my static image (the image on the button) or a "error while reading mpeg stream. the network connect was lost" when i click the static image (the device button) and try to load it. If you want to access your cameras from outside your local network, then in the remote url fields you need to use some urls that are accessible from outside your network. The ones you have now are local url, so they wont work when connected through cellular network. So the IH app on IOS connects directly to the cams via the remote URLs and therefore i need to poke a hole in my firewall to allow the traffic through from internet (cellular)? I was hoping that that wasn't necessary. Spud, unfortunately I do have remote URLs in my config but still can't get it to work. I know the remote feed works (when I type it into a browser and log in with my Blue Iris credentials it's fine). And forced local in IH works ok. But when I go back to automatic, I get a snapshot with an overlay saying "Downloaded image has 0 pixels". Here are my HS3 settings. Does it work if you configure this same camera as a new Object in the IH app? It'd be nice to get it working for https instead so that i'm not exposing my camera to the internet with a non encrypted password. But I haven't tinkered with that yet. Frankly, i'm not sure if I can just use a self signed certificate to get that to work or whether i need a signed certificate. I had perfectly working cameras until I patched my server and updated Android. Normally, I wouldn't do both but the update on my phone kept popping up so I finally gave in before I thought I'd have to test Imperihome. Any other patches to my system didn't impact it. So the scoop is that my current configured cameras (of almost 1.5 years) worked without issue. However, now, the current camera comes up with a frozen image from Friday and complains with "Error updating Garage Cam". If I clicked the frozen image, I could get to the camera and watch it real time. So it worked but only when I clicked it. I decided to remove the camera and try to re-add. Now, I still get the same error "Error updating Garage Cam" but with no option to watch the live feed. Before, I had two cameras on the same screen within Imperihome which would update both without having to click the image to get to the real-time view further (Even though I was enjoying real-time on the screen with both anyway). I don't know where or how to troubleshoot this. Do you have any ideas? Btw, I've rebuilt the cache on my HS machine and restarted the PI numerous times. Any ideas in getting this resolved would be greatly appreciated. Did you ever get this resolved? I'm having the exact same problem. Using BI.